Shuffle 1 “Harpie Lady Sisters” from your Monster Zone into the Deck, then you can Special Summon 3 “Harpie” monsters with different original names, 1 each from your hand, Deck, and GY. For the rest of this turn after this card resolves, you cannot Special Summon monsters, except WIND monsters. If this card you control is destroyed by a “Harpie” card's effect or your opponent's card effect: Add 1 “Harpie” monster from your Deck to your hand. You can only use each effect of “Harpie Lady Elegance” once per turn. Harpie Lady Sisters, and by extension “Cyber Shield”, appear in this card's artwork. 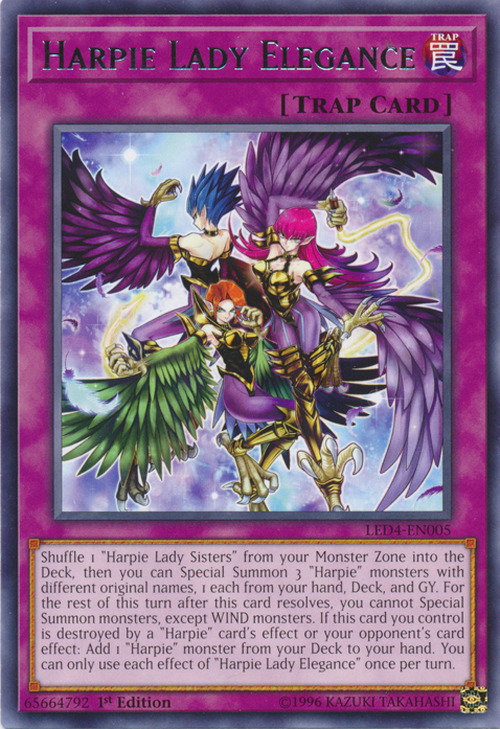 This card's name refers to the episode of the same name from the Duelist Kingdom Arc in which Mai Valentine plays Harpie Lady and Harpie Lady Sisters for the first time. This card's effect may also refer to the fact that in the anime, despite being treated as one monster, the sisters are capable of attacking thrice in the same turn.